I don’t care what your ‘go to’, ‘never fail’ eyeshadow(s) are, once you try Fyrinnae, an immediate love affair will begin. I will devote an entire post on this company highlighting their loose eyeshadows and professing my undying love of them. Here is one of my favorite looks. I love gold/orange/red combos. 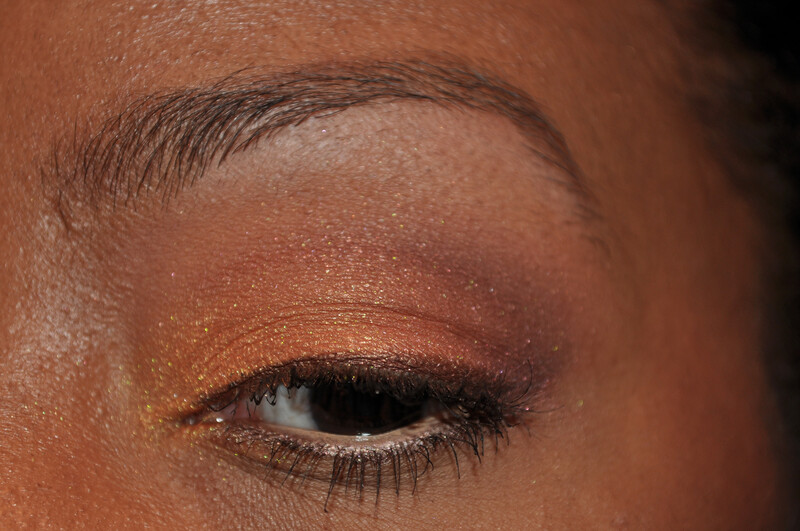 I will post variations of this look using different products and colors. I tried different light sources and flash/no flash, but unfortunately, I wasn’t able to capture the true depth of these colors. I used a liquid foundation for this post, but I use Everyday Minerals powder foundation in my daily routine. I purchased the MUFE HD for a special occasion. I will use it for posting pictures to my blog, but I doubt I will repurchase. 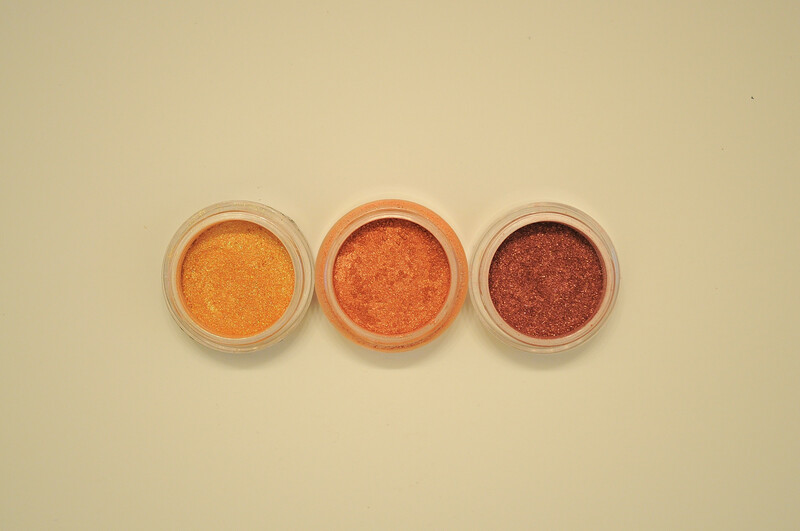 Fyrinnae offers its own eyeshadow base (Pixy Epoxy) that make their shadows pop so much, its close to glow-in-the-dark. I typically don’t use it when I’m going to work because it will make my eyes very, very bright. 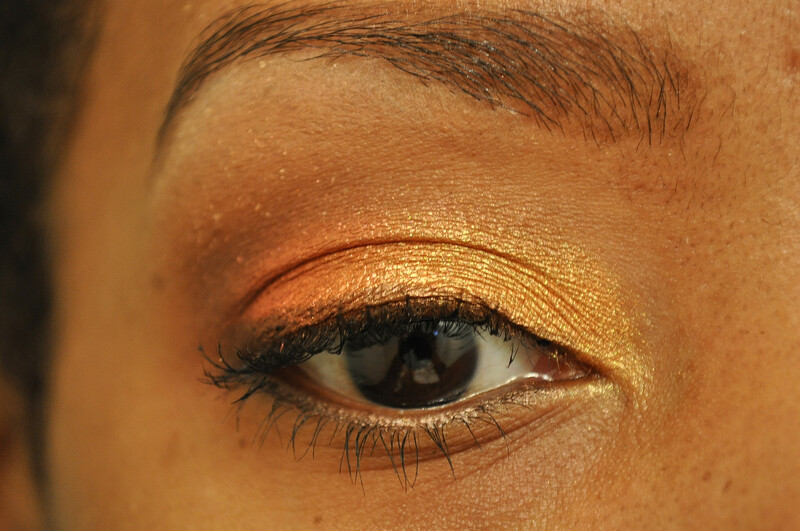 I re-created this look using their base so you can see these great colors in all its glory (see below). 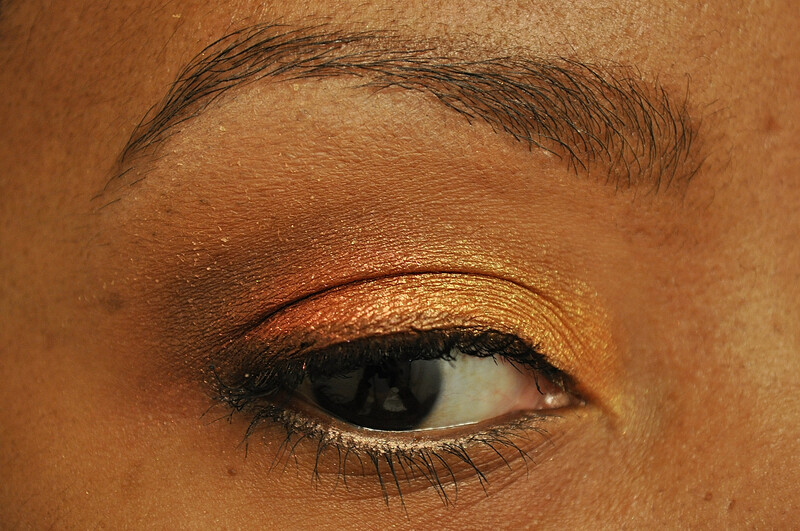 In this look, I didn’t use a dark paint pot because it will eat the colors and make the very dull (not in a good way). I first apply MAC Tete-A-Tint on my brow bone; MAC Vanilla as my highlight and MAC Saddle in my crease. I deepen my crease by mixing MAC’s Handwritten and Embark to my outer crease. This is shown below. 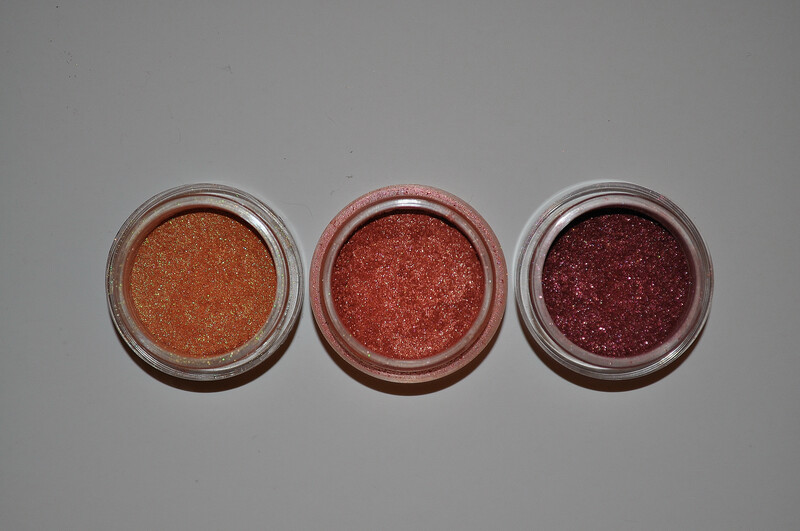 Fyrinnae’s Pyromantic Erotica is then applied to the inner two-thirds of my lid, Red Panda in my center lid and Candy Coated to the outer third and blending into my crease. Below are the swatches used on my lid and crease. Pyromantic Erotica is what Fyrinnae calls an ‘Arcane Magic’. The color changes as it is moved closer to a light source. This particular shadow changes from a golden yellow-orange to a bright orange. It is fabulous and one of my favorites. 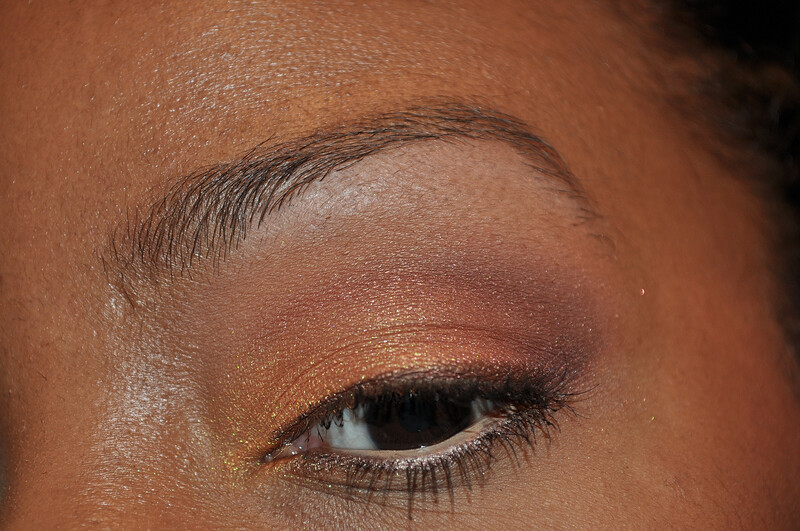 Click here, (no here) (right here) to see this look redone using Fyrinnae’s Pixy Epoxy base. 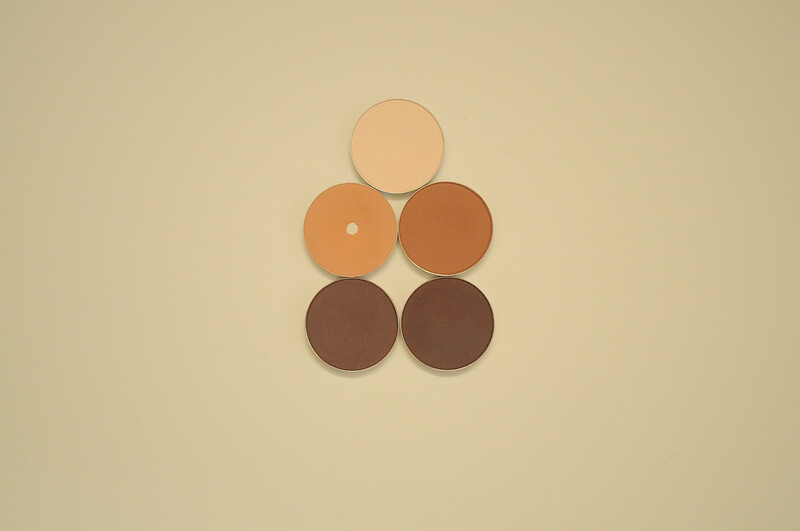 HUGE tip: If you plan on using PE with a pressed or matte shadow, lay those shadows down first. If not, it will go on blotchy. 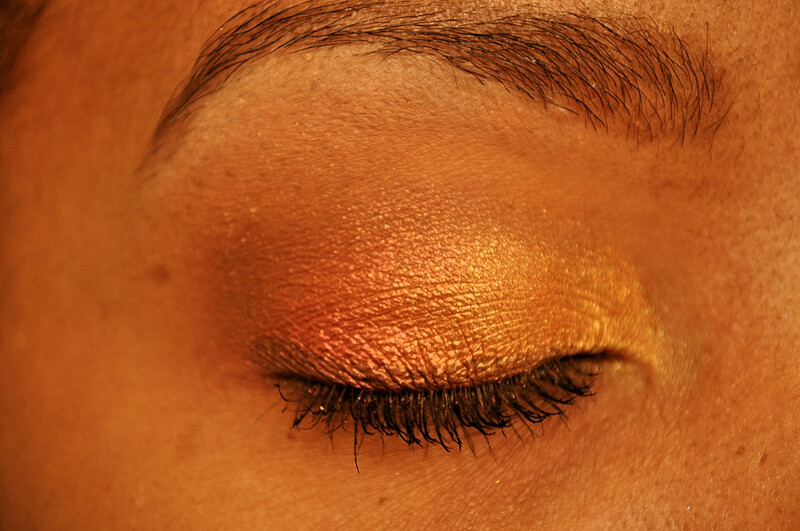 Once you’re happy with how it looks, apply a tiny amount of the PE on the lid and lay down the Fyrinnae loose shadows. (The only thing different from these pics versus the original post is of course the PE, my crease is a little deeper in color and I didn’t use a lash primer or the Chrom pencil on my waterline.) Sorry the pics are so large. Please be kind and not look at the size of my pores.